Too little contemporary painting delivers a sense of adventure either to informed or uninitiated viewers. Count the work of Los Angeles painter Yvette Gellis an exception. Her paintings, in Toomey Tourell’s final exhibition at its Geary Street address, make a bracing impression. Their unpredictability is rooted in materials as well as style. One piece has a Plexiglas panel pegged to its surface, which serves both to activate all the work’s details in surprising fashion and as a symbol of Gellis’ rethinking of what she made. Ruched gauze emerges from the surface of another small work, like a studio secret inadvertently divulged but then allowed to show. 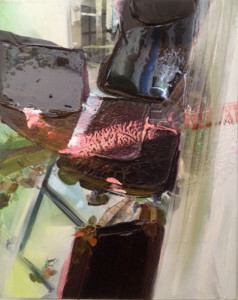 The wonderful “Ruin in Pink” (2014) typifies in many ways the work Gellis shows here. At its lower left corner, cruciform bands on a white ground hint at a viewless window, seeming to invite light to stream throughout the picture. Dark-hued knife and brushstrokes spring forth suggesting stacked books or planks, giving way to a flurry of detail in the painting’s upper right quadrant – a nearly pure instance of how the painter’s hand can set a viewer’s eye dreaming. The uneven success of Gellis’ work in this selection testifies to her willingness to strike out in any direction for the sake of her art’s liveliness.